Update added the Time Horizon timeline which includes events at various time bands. Regular readers of this blog know that I intermittently opine on what are appropriate time horizons. This it seems is an underlying feature of many failures and successes in many areas of human behavior. Allow me to present some recent thoughts and a modest proposal. These time horizons are approximated by using a logarithm based on five but changes to fit cognitive patters already established, vacillating between four and seven. * 2 days - What we do today and tomorrow * 1 week - What we do this week * 1 month - Calendar month * 4 months - This is a little longer than the standard accounting reporting and progress evaluation quarter year. It is a useful time scale to measure activities begun. The recent 100 days report card of a political leader fits here, though it is clear that only initiatives begun can be accounted for and the next two or three time horizons are much more important for evaluating said initiatives. * 2 years - This is the main deviation from the calendar or fiscal year as an important unit. One year is just not an effective measure of time for planning or evaluation. It is either too long (should be quarterly) or too short (should be 2 years). Two years can show measurable progress of short and medium-term projects. * 8 years - This is a median between the 5 and 10 year mark, which are cognitively problematic. This timeframe is for time horizon of real change occurring. Humans overestimate what can be done in 5 years and underestimate what will take place in 10 years, hence a more useful 8 year mark. In addition, mastery of a field of activity takes 10,000 hours. While this number is certainly approximate, it is something possible within 8 years of dedicated effort (3-4 hours/day). * 40 years - The lower end of lifetime expectation, the length of a career, what can be accomplished through real effort over an extended period of time. Nobel prizes and other lifelong achievement awards are granted for this kind of timescale effort. Significant environmental measures considerations can be taken into account. This is an area where dreams of the future can be considered and possibilities imagined. Planning cannot take place here, except in terms of long-term policies that are embedded in cultural values and constitutions. Population effects are realized at this scale, both human and otherwise. Extinction models can be done at this scale. Human architecture should be designed at this range, instead of the 8 year or 2 year range. * 200 years - The range is useful for dealing with global climate and long-term trends and shifts. Consider that the industrial revolution took place within the last 200 years. Human cultural shifts, sociology and anthropology can take account of many generations. Genealogy and population group history belong here. * 1,000 years - Genetic selection and migration issues are traced globally. Human history and the history of civilizations is at this level. Moving from this timescale any further out is of interest only scientifically as it has no meaning on a planning horizon. Even here things are at the extreme limit of imagination, though consequences which impact out this far should be of some interest, such as the half-life of radioactive substances, whether Mars should or could be colonized or terraformed, or planetary-scale trends and cycles. These 9 time horizons are not simply a from now forward time but also should be turned backward to give appropriate perspective. This will allow for adjustment and calibration of time lenses in terms of what kind of thinking should occur within each horizon, and how that thinking should shape our behavior and activities. If time is speeding up, then we can measure this rate of change as well as calibrate our time lenses and expectations based on this model. Complex Adaptive Systems are known to display emergent properties. That is, features at a particular level of complexity or description can produce emergent features which are completely different, at a different level of complexity or description. Obvious examples are behavior of individual ants and the emergent social features of the colony as a whole. Other examples in terms of economic behavior would be short term money making activity that later results in a complete collapse of a sector of the economy. Sometimes we use the term sustainable but that has been tarnished and rendered useless through overexposure. Instead we can use a neologism such as time horizon integrity. Retrospect tends to bless historical pronouncements with accuracy. Nonetheless it appears that giving to others means giving to posterity, shooting beyond the time horizon of one's own life and aiming at the 8th or 9th time horizon. 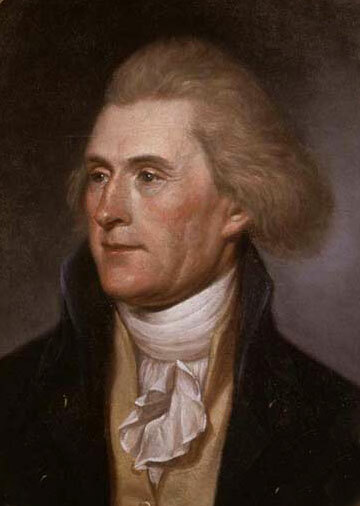 It is also notable that those things Jefferson authored that could be such a gift to generations were all concerned with freedoms: political, religious, and educational. Postscript: Just in case the tone is a bit hubristic, I will post next the great Shelley poem Ozymandias.